A great smile is essential for putting your best face forward. At Stewart & Hull, we not only restore teeth to their original condition; we make many Rockford MI smiles better than they ever were before! Some patients have only a few problems they wish to correct. Perhaps one or two teeth are misshapen and seem out of alignment. If the problem teeth are only superficially crooked—meaning they do not need to be moved into place with orthodontia—porcelain veneers are the answer. Veneers are wafer-thin porcelain covers that are attached to the front of one or more teeth. They are extremely versatile and can correct shape, color, or both. If you like your teeth just how they are, then straighten them using Invisalign Clear Braces. 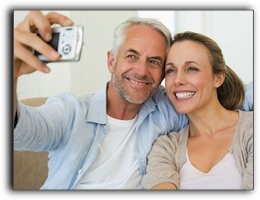 Some of our Grand Rapids and Comstock Park dental patients were happy with their smile in years past but now want to bring up the whiteness a notch or two. Teeth whitening is a popular procedure for our Rockford MI cosmetic dentistry clients. We provide a variety of teeth whitening options for every type of smile. If you are ready to brighten your smile, please call our office to schedule a free consultation. We look forward to helping you find the best tooth whitening system for your smile and life style.